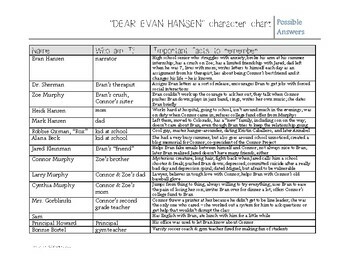 This CCSS-aligned teaching packet contains activities for Dear Evan Hansen, by Val Emmich, Steven Levenson, Benj Pasek, and Justin Paul. 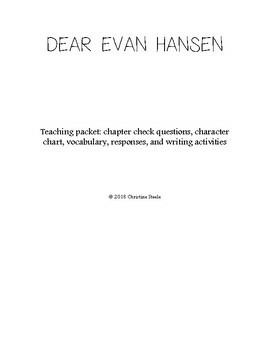 This includes chapter check questions, vocabulary, a character chart and several writing prompts and activities. Several short responses could also be used as essay prompts. Answer keys are included. Vocabulary has three separate matching quizzes to attempt to limit cheating and encourage proficiency and mastery; there are 45 vocabulary words total. 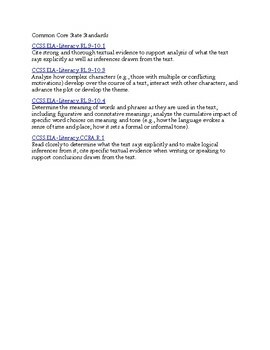 The chapter check questions are divided into segments with lengths varying as chapters vary, and are perfect for homework, comprehension checks, independent study, make-up work, or quizzes. There are end-of-novel essay/discussion questions as well. Everyone needs to read this book.